21" Tall with two 7" sharpened, stainless blades. Polished steel fittings and wire wrapped handle. Complete with removeable stand with wall fixings. 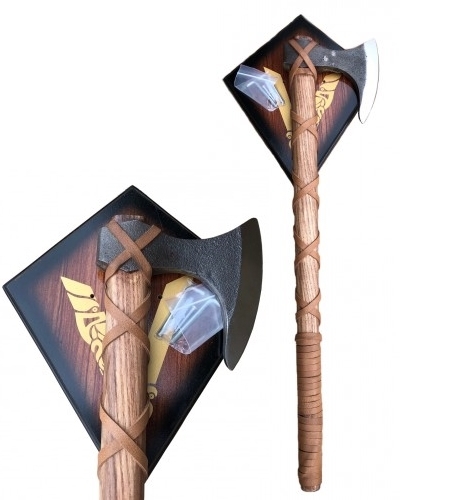 47cm Overall, this reproduction of the axes smoked at Native Indian treaties features a polished stainless steel axe head (edged but not sharp) and wooden shaft, ready for smoking at your own peace treaty. Imitation fur handle wrap around. In medieval warfare the armoured knight represented the ultimate in shock cavalry. Fully clad in the best armour of the day and impervious to all but the most specialised weaponry he dominated the battlefield. Typically he was armed with a lance, sword and dagger, but after the inevitable loss of breakage of his lance it was not his expensive sword he would reach for, as the greatest percentage of hit fighting would be done with more specialised weaponry. 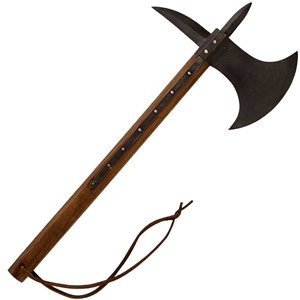 The horseman's axe was a short hafted weapon and very effective at delivering heavy blows with the axe edge in a battle situation but as many of these medieval axes also sported a spike on the opposite side of the axe head the weapon had equally devastating armour piercing capabilities. Often medieval axes had protective strips called langlets riveted to the side of the haft to protect against cuts to the wood. Horseman's axes were used extensively between 1300-1500. Well made with sharpened stainless blade. 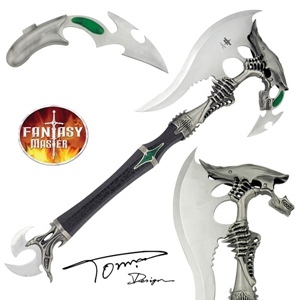 Removeable dagger, polished metal fittings, stunning design, highly recommended. 21" Overall with a 7" sharpened, stainless blade. Polshed steel fittings, black ABS handle with leather look finish, wire wrapped metal handle and polished metal pommel. Complete with wooden display stand and wall fixings, nice item. 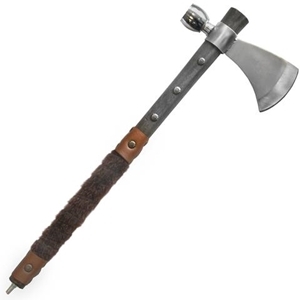 Styled from the hit TV series Vikings comes this unofficial reproduction of the Ragnar axe.